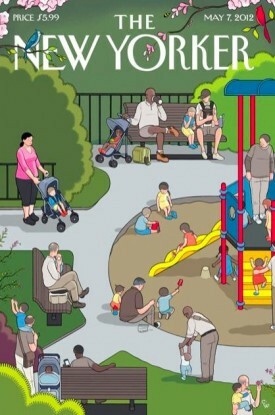 The May 7th issue of The New Yorker features a Mother’s Day-themed cover by Chris Ware. The art editor who oversaw its creation is Françoise Mouly, who, since joining The New Yorker in 1993, has guided more than 950 of the magazine’s covers, including some of the most iconic of recent years (including the September 11, 2001 black-on-black cover with Art Spiegelman, and Barry Blitt’s “terrorist first bump” cover in 2008). In the new book Blown Covers, Mouly shares cover concepts that never made it on the magazine, with sketches from a roster of New Yorker artists with whom she works regularly. Mouse over each image to see Francoise’s notes on the entries.